Z Gundam Master Archive: any interesting tidbits? So I've been glancing at the Z Gundam Master Archive, and in it, it makes mention of the Z Gundam going through a number of stages in it's career; Initial model, Initial Model + Wave Shooter, Mid-Model, and Late Model, all of which except the Wave shooter only have very slightly different features and blink-and-you'll-miss-it inconsistancies in their proportions and armor (they're easier to spot if you open the links in new tabs and go back and forth between them.) I was just wondering what the details were regarding these subtle changes, and what time periods these versions were used. I noticed the Wave Shooter variant shares the wing binders and shield from the old High Grade version of the Zeta Gundam, which I imagine is meant for perhaps working better in earth's atmosphere or something. 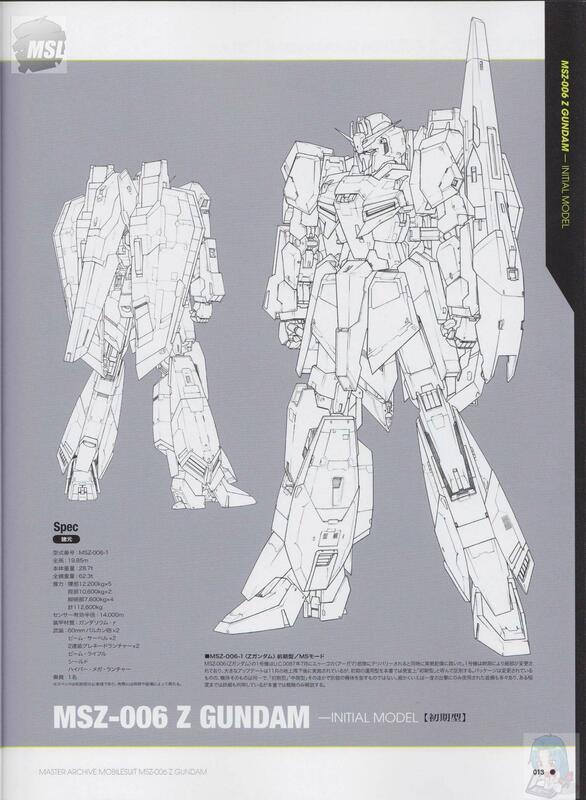 In addition, the book gives us some spiffy new art for Karaba's Zeta Gundam; the Strike Zeta, as well as the Prototype Zeta Gundams, and I was wondering if this book gave any new information on these models that we might not have heard before, particularly the Strike Zeta, which seems decidedly different from Amuro's MSZ-006-3. Last edited by J-Lead on Sat Dec 29, 2012 9:26 pm, edited 1 time in total. "I'd show Loni the power my parents gave me if you know what I mean." Re: Z Gundam Master Archive: any interesting tidbits? According to this book, the Wave Shooter version of the Zeta Gundam (originally created by Kunio Okawara for the High Grade kit) was designed with variable-geometry wings for atmospheric flight, and was thus the direct predecessor to the Zeta Plus. There's a bit more interesting back story on the earlier Anaheim designs, though. Says here that the RX-098 was originally going to be armored with conventional armor materials, until Char turned up with the Gundarium Gamma recipe. 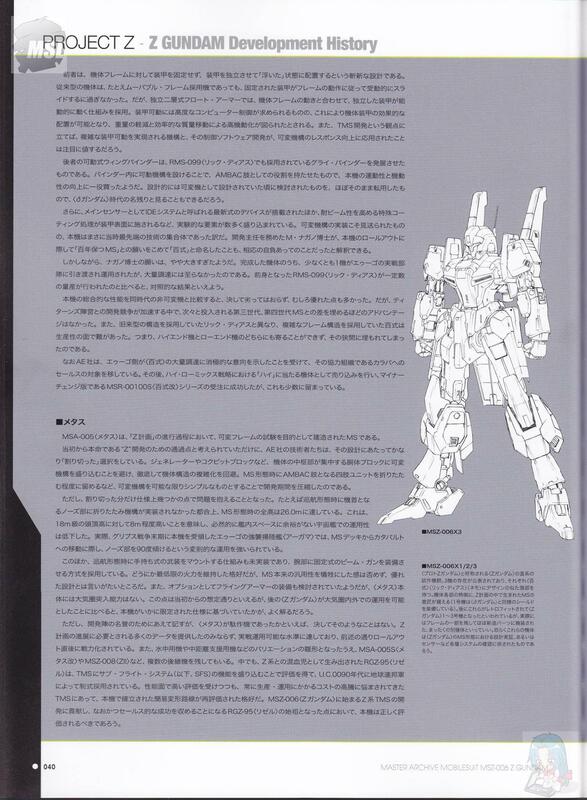 It also says that the Hyaku Shiki, contrary to some reports, was originally designed as a non-transformable machine; they briefly considered making it transformable (in the form of the Delta Gundam), then reverted it back to the original plan. 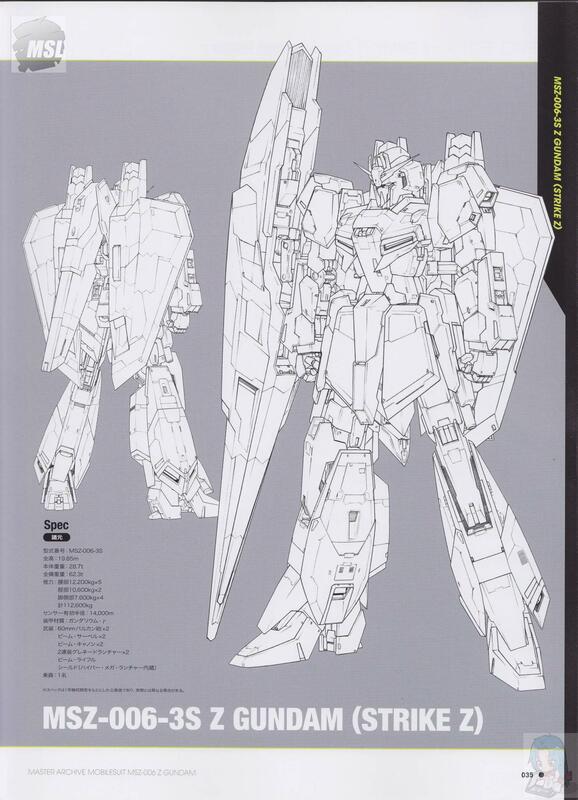 Speaking of which, I'm both repulsed and intrigued by the MSZ-000 "Zero Shiki" that Master Archive mecha designer Takigawa created for the Zeta Gundam Define comic serial. Apparently, this was created in response to comic artist Kitazume's dislike of the Hyaku Shiki, which he feels is implausibly similar to the Gundam Mark II. The Zero Shiki, which takes its place in the comic, is supposed to be a Gundam-type derived directly from the Rick Dias, with no Mark II elements in the mix. 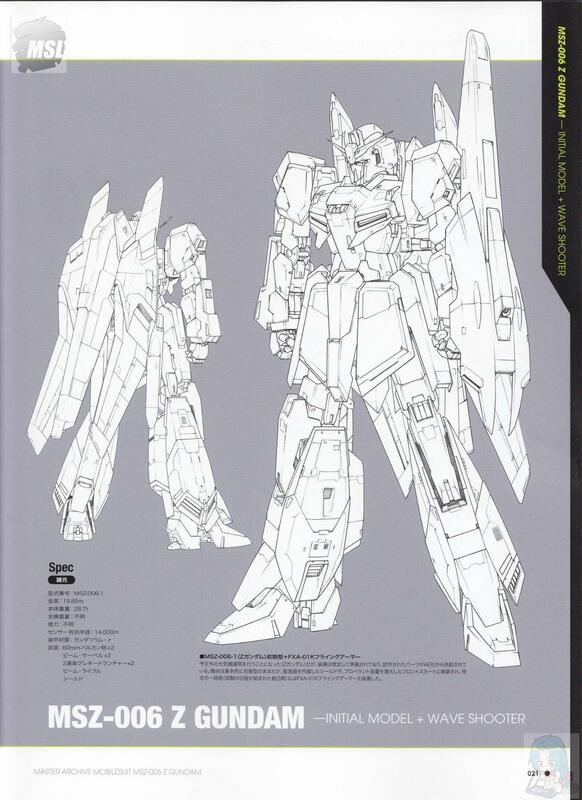 Looking at the design, it seems to be prefiguring the Zeta Gundam in some respects, with elements of the Nemo in its legs and backpack; in short, a purebred Anaheim design which connects the Rick Dias to the Zeta Gundam. As far as I can see, there's no way to fit this thing into the orthodox continuity, and it's essentially an alternative take on the Hyaku Shiki. Interesting design, though. toysdream wrote: Speaking of which, I'm both repulsed and intrigued by the MSZ-000 "Zero Shiki" that Master Archive mecha designer Takigawa created for the Zeta Gundam Define comic serial. Apparently, this was created in response to comic artist Kitazume's dislike of the Hyaku Shiki, which he feels is implausibly similar to the Gundam Mark II. The Zero Shiki, which takes its place in the comic, is supposed to be a Gundam-type derived directly from the Rick Dias, with no Mark II elements in the mix. Looking at the design, it seems to be prefiguring the Zeta Gundam in some respects, with elements of the Nemo in its legs and backpack; in short, a purebred Anaheim design which connects the Rick Dias to the Zeta Gundam. I'm not a particularly big fan of it myself. It just seems somewhat uncreative, like a bad franken Gundam. Besides, I always thought the point behind the Hyakushiki was that it was basically the AEUG's abridged version of the Mk II that had began life on the drawing board as a totally different machine before they decided to incorporate the movable frame into the mix, effectively turning it into a Mk II doppleganger. Jerid even called it a poorly made Mk II wannabe. In any case, what about the initial/mid/late versions of the Zeta? What's the deal behind those? Kitazume's got a pretty interesting take on details if he'd take the time to draw minutely different features for the Zeta throughout parts of it's service. Last edited by J-Lead on Sun Dec 30, 2012 3:25 am, edited 1 time in total. Question: is the Strike Zeta's Hyper Mega Launcher already incorporated on the huge shield, or it's for future possible equipment? This is the model number listed for the prototype Flying Armor tested during the Jaburo landing operation. Delivered and deployed in July of U.C. 0087. Equipment: FXA-01 Flying Armor. FF-XV-SH-609Z shield. Head vulcans are MU-86G model, with a rate of fire of about 4,000 rounds/minute and an estimated ammo capacity of 200 rounds each. Each arm houses two 300mm grenade launchers with two rounds apiece. Side skirt armor houses A.E.BLASH XB-G-35/Du.105 beam sabers. Armament includes XBR-M-87A2 beam rifle and FXA-03M2 Hyper Mega Launcher. Propulsion: Rear skirts house one AE-R-03-1800B thruster (same kind used in Methuss) and four AE-R-04-1600AS thrusters. Flying Armor houses RE-M86-Tw nuclear thermal twin engines. Circa November of U.C. 0087. Equipped with FXA-01K Flying Armor developed at Karaba's request. As well as a shield with built-in thrusters, this version also has enlarged front skirts with increased propellant capacity. A major "update package" applied in December of U.C. 0087, after Zeta Gundam descended to Earth and then returned to space. Modifications: Changes to shoulder, rear skirt, and leg thrusters. Changes to chest exterior, forearms, and knee covers. Increased propellant capacity in shoulders, front skirts, and legs. Grenade hatch added to forearm to support external magazine. Equipment: FXA-01B Flying Armor, wth enhanced engine output and atmospheric flight capabilities. Propulsion: Rear skirts house one AE-R-03-2000AS thruster and four AE-R-03-1600ASX thrusters. The Argama received virtually no support from AEUG headquarters during the early stage of the first Neo Zeon War, but the Zeta Gundam received a final upgrade in March of U.C. 0088. The equipment that was delivered included parts from the Zeta Plus, whose specifications were being finalized at the time. Modifications: Enlarged chest exterior (Zeta Plus version). Arm frame also changed to Zeta Plus version. Enlarged front skirts. Leg generators replaced with new APR-75-Z4 model, with roughly 10% greater ouput, and weapon latches added. Rear skirt thruster output enhanced. Circa December of U.C. 0087. Equipped with FXA-01K-VW2 Flying Armor, also known as the Strike Unit. Shield includes a hyper mega launcher with its own independent generator, as well as a weapons bay. Beam cannons installed in side skirt armor. As usual, there are a lot of redundancies and contradictions in there. One of the few slots that isn't taken is the FXA-02, so maybe that could be used for Char's Mega Bazooka Launcher? Last edited by toysdream on Mon Dec 31, 2012 2:39 am, edited 2 times in total. toysdream wrote: MSZ-06-1 Z Gundam - Initial Model + Wave ShooterCirca November of U.C. 0087. Equipped with FXA-01K-VW Flying Armor developed at Karaba's request. As well as a shield with built-in thrusters, this version also has enlarged front skirts with increased propellant capacity. So according to the Master Archives version of events, the Wave shooter might have been used during the Dakar battle? Kilimanjaro seems unlikely, since only a day passed from the time Kamille and Char landed, but they had almost two weeks to build new parts and swap them out in time for Dakar. Wait, so the FXA-01 (and variants) for the Zeta consist of the backpack/binders and the shield... am I getting this right? As far as I can tell, the FXA-01 consists of the back binders and the tail stabilator, but not the shield. Go figure! As for the Wave Shooter, I re-read those passages more carefully, and it seems as if these were tested by Karaba during the interval when Kamille's Zeta was in their possession - in other words, the period between Kilimanjaro and Dakar. Karaba actually tested two sets of Flying Armor during this period. The first was the FXA-01K Wave Shooter constructed based on data supplied by Anaheim, and the second was a variable-geometry FXA-01K-VW version which isn't shown in the book but was apparently the basis for the wings of the Zeta Plus. This second version showed good results during test flights, but was never used in combat. 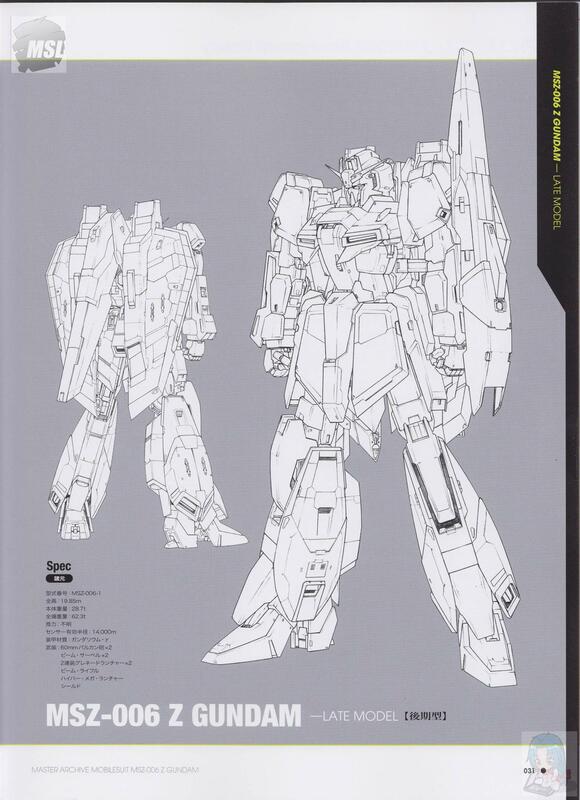 The book insists that the Strike Zeta is equipped with an FXA-01K-VW2 version derived from these, although of course in the artwork it looks just like the Flying Armor of the original Zeta. Incidentally, the Zero Shiki is not a new concept at all. There's been a bunch of references to it it seems (based on some concept art) but Kobayashi Makoto originally designed a unit that was given the name "Zero Shiki Prototype" (My Anime magazine 1985.05). Heck, to me the unit looks eerily similar to the Epsy Gundam lineart. Are you sure that's authentic, Deacon? To me it looks like someone took the images from older Master Grade manuals and photoshopped the Mk-II's head onto the Hyaku-Shiki's body. Sakuya: "Whatever. Stop lying and give up your schemes, now." Yeah, on the Gundam Wiki it's credited to "Gundam Man". 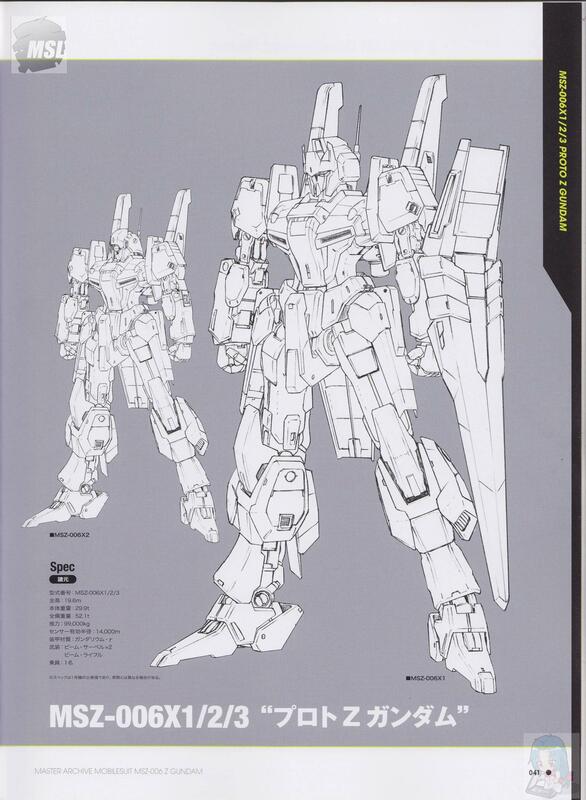 It's clearly a fan-made photoshop of the MG Hyaku Shiki line art, and it doesn't look anything like the actual Epsy Gundam. When I first saw the Zero Shiki, I did think of the Epsy Gundam (because of those back binders), but the head, shoulders, legs, etc totally different. Aside from maybe the arms and the general shape of the chest, it seems like they each picked a different subset of the Hyaku Shiki's features to borrow. I had a sneaky suspicion that was a dud... given it says Epsilon on it. But, even in the original there are some similarities as Mark noted.